The heart speaks, writing in tears. The voice of the heart is silent. It can only gesture. The heart is a mute. It cannot voice out. It is not loud, it is not clear, it is not exposed. The message of the heart is hidden. So many words are being swallowed up unspoken, or spoken only in that secret language of the heart. The expression is lost on us and one is a castaway on an isolated island when it comes to the heart. Heart is an unreachable island. But sometimes, the heart speaks, writing in tears. We get a letter from a far away island. When it writes letters to you in tears, be a good listener and let the tears fall down. 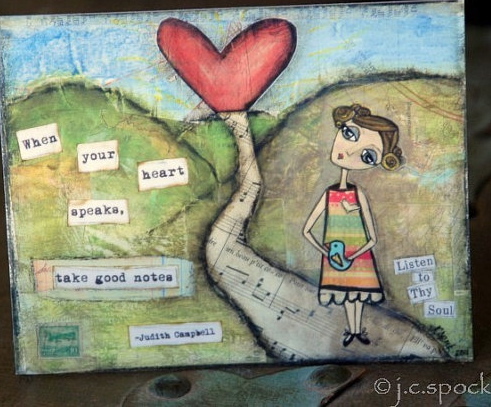 Let the words of the soul overflow all over your face and let your heart vent. And that’s exactly what I have been doing this past week. By the time Thursday came around, I was feeling calm and serene. Yet, I still felt the strong resistance building up against the idea of going out. If it wasn’t the Adoration of the Blessed Sacrament, I don’t think I would have braved myself to go outside to embraced the world. It feels like the whole world jumps at me at times and I get overwhelmed. Especially when my heart is sending me letters. When it is speaking, writing silently in tears, I am in no mood for any kind of outing. My time at the Adoration was a struggle. For someone who relied on her physical sensations for the cues, and perhaps many imagined voices, it isn’t easy to sit still and wait out the complete silence. When God is silent, the silence of one’s heart has nothing to compare. When God is silent, one will immediately find out how loud one’s heart has been all along. Praying the Chapel of Divine Mercy helped to silence my waking heart. I was glad that I was too tired to have any thoughts. My brain was exhausted and it only wanted to sleep. I will confess. I spent half of the time there dozing. When I looked at my silenced phone to check the time, I noticed that one hour had passed. I started packing up my things to leave. I bowed down my head to say my final prayers to Jesus. I felt my heart warming up at the thought of going back home. My parents were waiting for me back home. How…heart-warming, I though. I spent so many days opening the door alone to let myself into the dark empty house. But not any more. My parents were waiting for me back home. Not only my parents, but my sister and her loud children, too. The house was full of people waiting for my return. For the first time in days, I heard my heart speak. Not in tears, not in her secret language that I cannot comprehend, but in a very familiar voice. And I knew my heart was back home again from her journey to the isolated island. Previous Post Will the Real Me Please Stand up? Hello Diane! It was a day with a happy ending. When you live in God’s grace, every day ends with a happy ending!